In 1987 Mrs. Tasanee Keereepraneed started to care for orphaned children in her village of Ban Tha Song Yang (also known as Mae Tawo), Thailand. Having lost her own father at a young age and her children also having lost their father, Tasanee decided that she would care for the orphaned children of Thailand and Burma. Ban Tha Song Yang is about 2 hours north of Mae Sot on the Thai/Burma border. It is a picturesque Karen village in northern Thailand. It sits next to the Moei River, is surrounded by jungle and beautiful limestone mountains. It’s a small village where all the kids play together and all the parents know each other. Tasanee and her brother converted their childhood home into an open space to accommodate the children. Starting with whatever funds were available, she built the foundation of what has become the first Safe Haven Orphanage. Relying on her personal funds and the donations of the people of Mae Sot, she was able to expand and take on more children. She now has over fifty children under her care. Safe Haven Orphanage is a home that provides disadvantaged children with proper nurture, nutrition, shelter, clothing, medical care, and education. Safe Haven Orphanage is open to children from all communities, faiths, and cultures. Who runs Safe Haven Orphanage? Tasanee – affectionately known as Big Mum by all the children at Safe Haven. Tasanee (affectionately known as Big Mum) and a number of local staff run Safe Haven Orphanage. Donations received from volunteers and visitors are used to cover the daily costs of running the orphanage. We also receive support from some Non-Government Organizations (NGO’s) who assist with food supplies and health checks. Currently, Safe Haven Orphanage is looking to become a registered foster home in Thailand. The main purpose of this aim is to ensure that all children in our care receive full legal status as citizens of Thailand. As part of this process, a number of building projects need to be completed to fulfill the regulatory requirements. As funds become available, materials are sourced locally or from Mae Sot and labor is contracted locally. Projects we are looking to complete in the near future include a more sustainable water supply, dormitories for more children and a specialised health clinic. 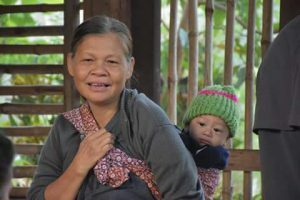 It all began about 25 years ago, when Mrs Tasanee Keereepraneed received a frantic message from a local villager in Tha Song Yang, Thailand that a little girl had lost her mother during birth. In Karen culture this is interpreted as a bad omen, and the child is often killed. Having lost her own father at a young age and her children also having lost their father when Tasanee’s husband was murdered, Tasanee decided that she, if anyone should be the person responsible for caring for the orphaned children of The Karen. One by one they came, children with nowhere else to go were given to Tasanee to raise. She and her brother converted their childhood home into an open space able to accommodate up to twenty five children. Starting with whatever funds were available, she built the foundation of what has become the first Safe Haven Orphanage. Relying on her personal funds and the donations of the people of Mae Sot, Thailand, she was able to expand and take on yet more children. She now has over 60 children under her care. These days Safe Haven Orphanage is more like a large family whose members love and respect each other like brothers and sisters. Safe Haven Orphanage is located on the Thai/Burma border – May 2008. Safe Haven Orphanage is located in Thailand, about 2 hours north of Mae Sot, in a small town called Ban Tha Song Yang (Mae Tawo) which sits on the Thai/Burma border. Mae Sot is about 6-8 hours north of Bangkok by bus, and about 5 hours South West of Chiang Mai – also by bus. Ban Tha Song Yang is a picturesque Karen village in northern Thailand. It sits next to the Moei River which separates Thailand from Burma. It is surrounded by jungle and beautiful limestone mountains, which cut it off from the bustle of the outside world. Electricity was introduced only a year ago, and there is only one phone in the middle of the village. It’s what a small village should be; a small tight-knit community where all the kids play together and all the parents know each other. The children range in age from as little as 1 month old, to over 20 years old. 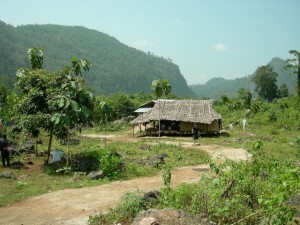 The majority of the children reside in Ban Tha Song Yang (Mae Tawo), where the local school is so overcrowded and under-funded that it finishes at grade nine. To finish high school and begin college, the children must come down to Mae Sot to finish their studies. The children learn responsibility from a young age, they are expected to do homework and chores before being able to play with their brothers and sisters. They eat, work, study and play together, this infuses them with the sense of family that they desperately need. Most of our kids were orphaned by the Military government currently in power in Burma [see Background on Burma]. To steer the kids away from lives controlled by anger and revenge we rely on the kids to foster a sense of love and commitment within themselves. With anger in their hearts they would be doomed to the same fate as many of their brethren, hopelessly lost in a war they cannot win. Only through education and integration can we expect change for them and the Karen people as a whole. Burmese and Karen people come from a country with deep rooted customs and religion. For a westerner visiting the orphanage, there are a number of things that you need to observe. Some of these etiquette rules may be strange for westerners, however, if you follow some simple rules, your stay will be much happier. The children at the orphanage are extremely friendly and helpful, especially towards visitors, and by respecting their culture, custom, religious beliefs and etiquette you will gain respect from them. Dress – in particular females must always ensure that their shoulders and knees are covered at all times when in public eg. No singlet tops etc… This also includes when swimming. Burma is a devoutly Buddhist country, however some Karen people are Christian. Regardless of their religious belief it is extremely important to always show respect for their beliefs. Never use your feet to point to a thing or a place. This is considered an insult. Never touch a person’s hair, head or cheek, even if you consider it as a friendly gesture. Burmese people would not consider it friendly, and think it rude. Don’t touch any part of a lady’s body. Don’t point your feet towards Buddha’s image, elder person or any sacred place. Better not to point your feet to anybody at all. Do not step over people who are sitting or lying down. Do not show any signs of affection (even if you are with your wife/partner) in public. This is seen as extremely embarrassing and rude. Always remove shoes, socks and sandals when entering a building. Always treat monks with a high level of respect (regardless of their age). Women should never touch a monk or his robe and when handing an object to a monk, should use an intermediary or place the object in a position where it is easily retrievable. All the children from Safe Haven Orphanage are from Burma and are not Thai nationals, and are therefore ineligible for adoption. If you are looking to adopt from the region we suggest that you check out WACAP (World Association for Children and Parents www.wacap.org – please note Safe Haven has no affiliation with WACAP), who do adoptions through local orphanages and the Thai government. Please keep in mind that if you are looking to adopt a Burmese child, please make sure you do a thorough check of the agency doing the adoption as there is no adoption from Burma internal and some agencies employ unethical methods to obtain children from Burma. We also believe at Safe Haven, that even though the ‘West’ may seem to offer the children a lot more than they currently have, in the long term, the children are better off living with their many brothers and sisters in a loving family atmosphere and in a culture and lifestyle that they know and allow them to grow and be active and valuable participants in their communities.